Mention “Comic-Con”, and what usually comes to people’s minds is the San Diego Comic-Con, with its intimidating attendance rate of 100,000-plus. 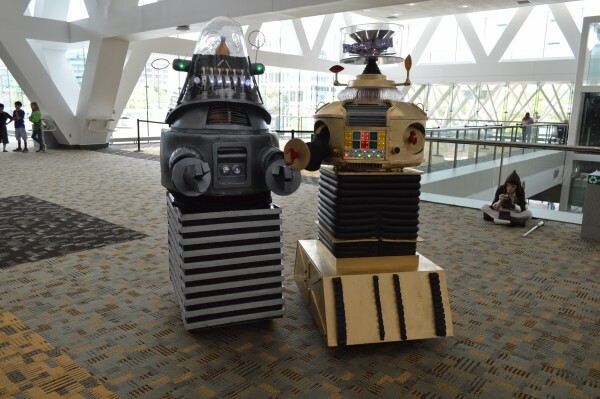 This weekend, however, a lesser-known but far more accessible Comic-Con took place right in the Baltimore Convention center, drawing fans, retailers, artists and writers, and anyone with a love for comic books, science fiction, and general nerdery. Now in its 16th year, the Baltimore Comic-Con has become as much a staple of fall here as Otakon has for the summer. While a convention focusing on the lagging comic book industry might not seem like the average person’s idea of a good time, a good look around Comic-Con reveals a little something for everyone, from the people who only watched The Avengers and The Dark Knight once in theaters to the true obsessives who can name every single item in Silver Age Batman‘s utility belt. The con’s largest and most immediate attraction is the Dealers Room, where comic book vendors peddle their wares. It’s a good place for local businesses to promote themselves, and the Parkville-based Collector’s Corner is no exception. Maki Rolle is one of the Collector’s Corner “booth babes,” scantily-clad women hired to lure men to the booth in the hope of a few extra sales. But Maki, dressed as Storm from the X-Men, is not your traditional model. 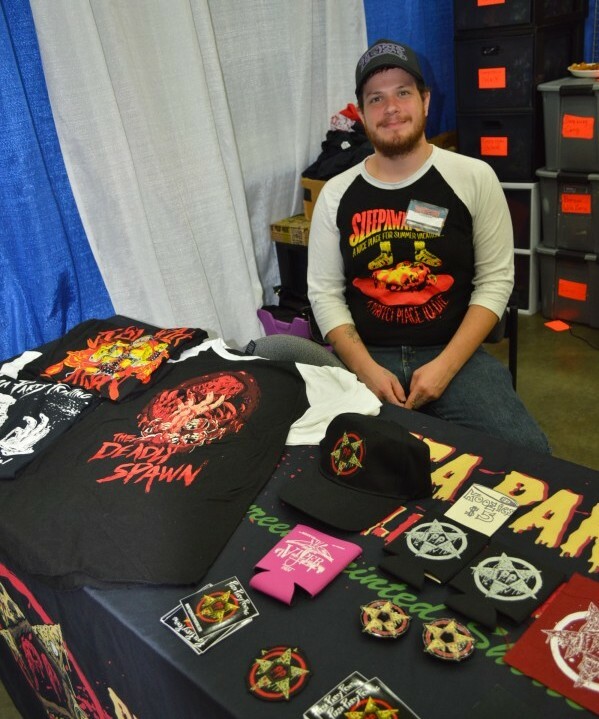 A few booths away, Pizza Party Printing, a Baltimore-based screenprinting company, drew our attention with their bold and grotesque t-shirt designs. Co-owner Daniel Petruccelli started the company in 2012, but has been screenprinting since long before then. “I started making t-shirts for my band when I was 15,” he explained. With shirts of Pizza the Hut from the Mel Brooks comedy Spaceballs, the exploding head guy from the sci-fi horror film Scanners, and Tetsuo, the mutated lump of flesh from the anime classic Akira, Pizza Party Printing’s nerdy horror aesthetic shares popularity with both sci-fi and horror fans alike. Pizza Party Planning shows that Comic-Con isn’t just for comics. 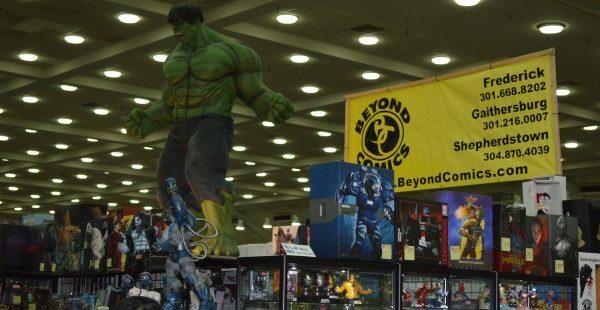 In the Dealers Room, action figures, t-shirts, keychains, anything and everything even tangentially related to comic books has its place among the shelves. There’s an entire booth for stuffed animals from anime (Japanese animation), including Pokemon of all kinds and the cute, fluffy mascots from magical girl shows. Some of the comic book vendors even sell manga, or Japanese comics, on the side. Something else borrowed from Japan: the word “cosplay”, or dressing in costume, which has become commonplace at conventions. Couples dress up as Superman and Wonder Woman– or, for the Marvel fans, Black Widow and Hawkeye. Stormtroopers from Star Wars stroll the halls alongside Spartans from the Halo video game series. And Deadpool, the wisecracking, fourth-wall-breaking Marvel superhero, is ubiquitous. 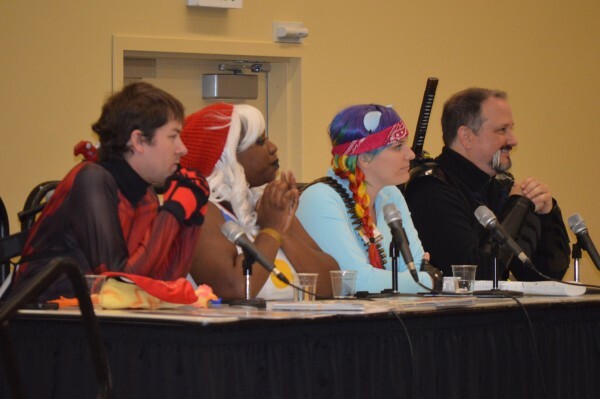 In the Friday evening panel “The Awesome Reasons On Why You Should Cosplay”, professional cosplayer and Youtube star Ireland Reid described her love for the hobby, calling it, “a form of freedom”. “You guys are influencing everyone in this room and you don’t even know you’re doing it,” she told the costume-wearing members of her audience. While the costumes varied wildly in quality, every single one of them had a story behind it, which Reid invited her audience to share. Cheers and applause accompanied every deeply personal account. Directly beside the Dealers Room is the Artists Alley, a place for amateur artists and creators to exhibit and sell their work. Prints of popular characters are plastered over every booth, style varying as much as subject– an anime-style 10th Doctor from BBC’s Dr. Who sits next door to hyper-realistic depictions of the Crystal Gems from Cartoon Network’s Steven Universe. 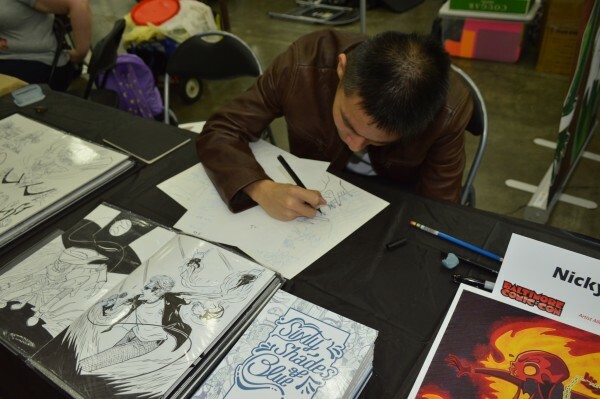 At the Artists Alley, we spoke to Nicky Soh, a producer, creative director and artist hoping to make it big in the comic book world. While his booth showcased many detailed, hand-drawn comic pages and a book of his designs and sketches, Soh seemed to disparage an off-handed comment that he was a professional artist. Was he here at Comic-Con to get recognized by someone higher up the ladder? Still, he praised conventions like Comic-Con as places to socialize, make contacts, and promote his art. On the other side of the Artist’s Alley, James Dufendach, PR and marketing of Maryland-based indie publisher PLB Comics, shared some behind-the-scenes secrets of being a tiny part of a languishing industry. Founded in 2006 by brothers Matthew and Josh Shockley, PLB produces two ongoing series: vigilante superhero tale The Fall, and vampire/vampire hunter buddy cop series Gideon & Sebastian. The group has been attending Baltimore cons for the past nine years. But when presented with the idea that this was what they did for a living, Dufendach just laughed. A point that Dufendach was keen to express was that comics were “literature, not just a throwaway art.” This is something everyone at Comic-Con agrees on. The upper floors of the convention center hold most of the con’s programming and panels, which took place throughout the weekend. Many of the panels were about specific comic publishers and stories, such as Friday’s “IDW Publishing: The Big Panel”, and Saturday’s “The Silver Age of Comic Book Art”, hosted by comic book historian Arlen Schumer. Louise Simonson, writer of Man of Steel, advised to “start with a question.” Terry Moore, creator of Strangers in Paradise, said, “I’ve always written about mysteries, things I can’t figure out.” With every new piece of advice from their favorite creators, fans cheered and took notes. Conventions such as these are often the only times it’s possible to get up close and personal with their idols. Though the subject matter might be dismissed by some, comic book lovers are prolific and passionate, and their talent is real. 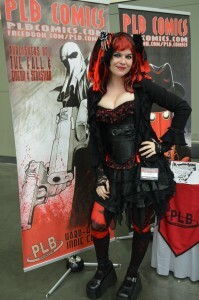 Baltimore Comic-Con is a celebration of that talent. It’s a place of safety and acceptance, where everyone is free to be themself. 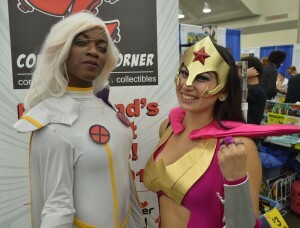 Though smaller than San Diego Comic-Con, or even Otakon (held at the convention center over the summer), it is no less an important part of fan culture. 2015’s con proved to be a resounding success. Be sure to check out our photo roundup of Comic-Con 2015!